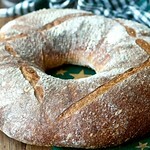 This Royal Crown Tortano Bread was such a delicious surprise. 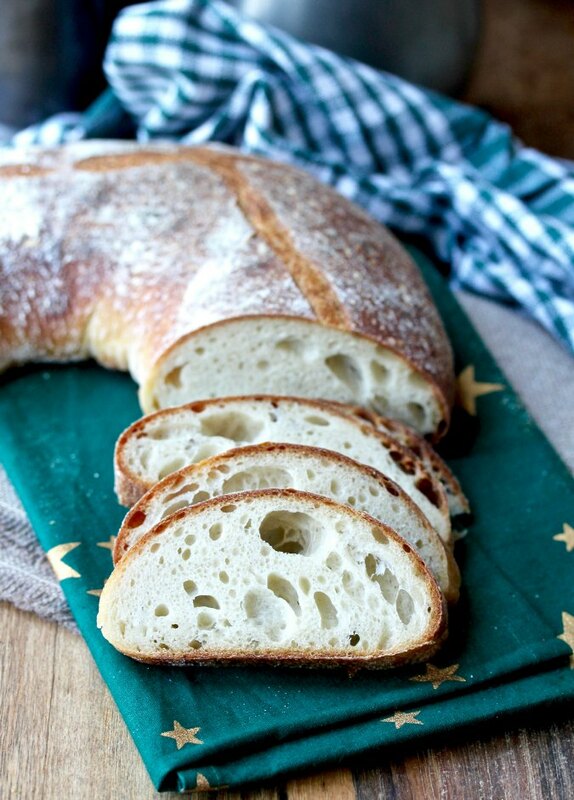 This Royal Crown Tortano Bread begins with a starter that contains a tiny amount of yeast. It also contains a small amount of mashed potatoes and honey, along with the flour, water, salt, and yeast. This Tortano Bread comes from the book, Artisan Baking by Maggie Glezer, published in 2005. It's considered one of the "must have" books about bread baking. It is a James Beard award winning cookbook, and the New York Times referred to it as "a landmark book." 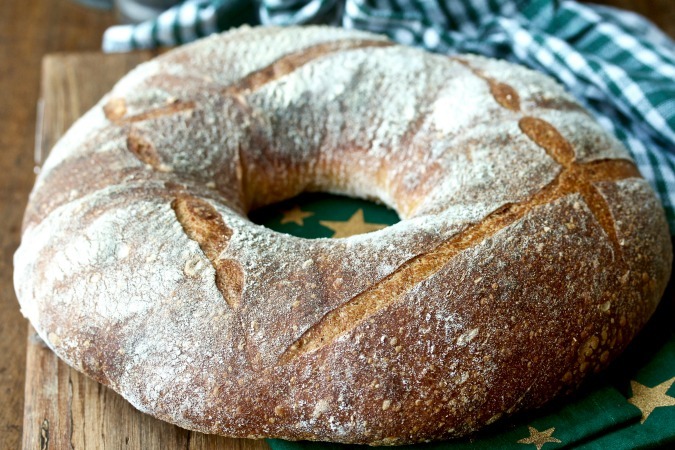 This Royal Crown Tortano bread marks the tenth anniversary of the Bread Baking Babes, which began as a group of twelve women from around the world who came together to bake bread every month. Ten years! And this was the first bread that they baked together. I joined the group in 2015, so I'm pretty much a newbie. This bread was definitely a challenge. While the pre-ferment got all bubbly and tripled in size, the final dough never rose... after hours! I'm pretty sure that the potato and potato water in the dough had something to do with it. The dough was practically liquid. I waited on the first rise for about 5 hours, and decided to go ahead an shape the dough. Once I shaped the dough and waited for an hour, I pretty much had a pancake with a hole in the middle, and the only reason I still had a hole in the middle was because I placed an upside down bowl in the center during the second rise (see this Auvergne Crown bread for a photo of the bowl and pan). At this point, I decided to just bake the dough and see what happened. I stuck the loaf in the oven, shut the door, and walked away. Five minutes later, I came back to peek into the oven window, and "boom!" the loaf had begun to show signs of life. I sprayed the oven a few times with water to keep the steam going, and willed the loaf to rise... and it did! I was completely stumped, and almost gave up, yet I was rewarded with this delicious and airy loaf. In the future, I might experiment a bit by using my starter instead of the yeast, or let the preferment finish rising in the refrigerator. I might also try adding some vital wheat gluten. After the recipe, be sure to check out the experiences of the other Babes with this bread... and wish them a happy anniversary! In a glass measuring cup, stir the yeast into the warm water and let stand for about 5 to 10 minutes. Add the flour to a medium bowl, and stir in 1/3 cup of the yeasted water (discard the rest). Mix with your hands or a dough whisk until the water and flour are well combined. Cover with plastic wrap and let rise for about 12 hours. If the ambient temperature is warm, place the preferment in the refrigerator after three hours. Remove it 30 minutes prior to mixing the final dough. Cut the potato into quarters, and cover with a small amount of water. Bring the water to a boil and simmer until the potato is tender. Reserve the water and refrigerate to add to the dough. Puree the potato and refrigerate the amount you will need for the recipe until ready to make the final dough. In the bowl of a stand mixer, roughly mix the flour and water (which may include the optional potato water) until you have a shaggy dough. Cover with plastic wrap and let rest (autolyse) for 20 minutes. Add all of the pre-ferment, honey, pureed potato, and salt, and mix with the dough hook on second speed for about 15 minutes. This dough will be very sticky and slack. Shape the dough into a ball, sprinkle with flour, and place it into a large oiled bowl. Cover with plastic wrap, and let rise until doubled (mine did not double, but had faint flat bubbles on the surface of the dough), about 4 hours. Do four stretch-and-folds every 20 minutes, at the beginning of the first rise. On a well floured work surface, shape the dough into a ball. Let rest for 20 minutes. Set up a 12 inch cake pan or a baking sheet with a small upside down bowl or custard cup in the middle and drape a couche or tea towel over it. Generously sprinkle the fabric with a fifty-fifty mixture of wheat and rice flour. Tighten the shaped dough by reshaping it into a ball on the floured work surface. Sprinkle some flour in the middle of the ball, and push your fingers through the middle of the dough to create a hole. Place the dough, smooth side down (turn it over), onto the floured fabric, with the bowl in the middle. Cover with oiled plastic wrap, and let rise for 60 to 90 minutes, until springy (clearly, this did not happen for me). Place a baking stone on the center rack of the oven, and a steam pan (I use a broiler pan) on the lowest rack. Preheat the oven to 500 degrees F for at least an hour. Bring one cup of water to a boil for the steam pan, and fill a spray bottle with water. When ready to bake, remove the plastic wrap from the top of the dough, and place a large piece of parchment paper over the dough, place a pizza peel or cookie sheet over the parchment, and flip the whole contraption over. Remove the pan, fabric, and then slash the dough with four cuts, and slide the dough onto the baking stone. Carefully add the hot water to the steam pan and close the oven door. Reduce the oven temperature to 450 degrees F.
Spray the walls of the oven generously with water a few times during the first 10 minutes of baking. Bake the loaf until it is very dark, about 40 to 50 minutes, rotating it after 20 minutes. Let the bread cool completely on a wire rack. Thanks so much Sally. This one was quite a challenge! Such a wonderful bread and look at those nice holes! Just as lien's your looks so well behaved! Thanks Karen. I was not well behaved when this dough didn't rise! You call it a surprise. I'm with you on that every time I've pulled this from my oven. It is a joy and a stunner. I think it's why we all come back to it. Forget newbie, Always a Babe. It looks perfect! I just pretended that it didn't matter that the dough refused to rise. What a surprise though when it gets such oven-spring, isn't it? Your loaf looks incredible! I still can't believe you added more water! But the end result is beautiful! Thank you Katie! I really thought all I would have are breadcrumbs. That is a great loaf Karen, I like your slashing! Happy anniversary! This just goes to show that bread just wants to be bread! Your loaf looks perfect! Happy Anniversary! Thank you, and thank goodness, right? Thanks Kelly. We fought over who got to eat this bread! A gorgeous bread and I know what you mean about the surprise. What went into the oven was unpromising & the result glorious. Great baking with you Babe! Thanks so much. I was "this close" to giving up! Looks amazing, and we bet it was the potato that didn't let this rise:) The cool part is that it did rise in the oven at the end! And it looks really beautiful! How did this taste like? There were some tense moments for sure! It was delicious and disappeared very quickly! !